Learning management systems (LMS) have a big job. Not only do they need to house your course work, they should help you market and sell your course as well. Thinkific strives to do just that. 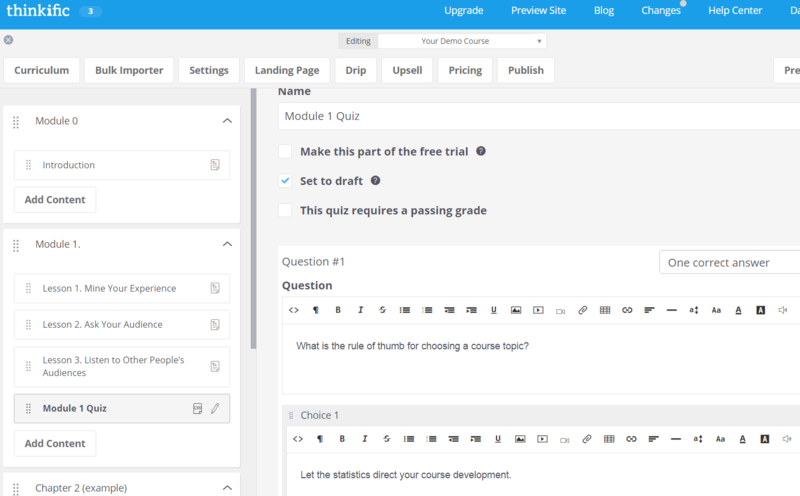 After trialing a number of online course platforms, I found Thinkific to be a stout platform that can be just the right fit for many course builders’ needs. Step 1: Enter your email address, password, and the name of your Thinkific site. Step 2: Choose a color scheme. Step 4: Tell Them More About Me. For demonstration purposes, I’m testing out the free account. I chose the blue scheme to start. You can easily customize the colors, even variant shades of colors for your site, by going into the branding area under “Site,” located in the left sidebar of Thinkific. Additionally, you can add your logo in the branding area as well. I have to admit, setting up my school took longer than I wanted. Maybe it was me being impatient, but I was ready to get my course created, not sign up for a dating service. On the other hand, it was nice to answer some of the questions about why I was setting my school up. It gave me a little pause for contemplation. For example, what is my primary purpose for setting up my online school? Branding? Lead generation? Sharing my knowledge for free? Seriously, they don’t say why they need to know this. I set up another test site with a different email, answered the questions differently, and didn’t see any differences. So, who knows? Now for the fun part: creating my first course. Woo hoo! 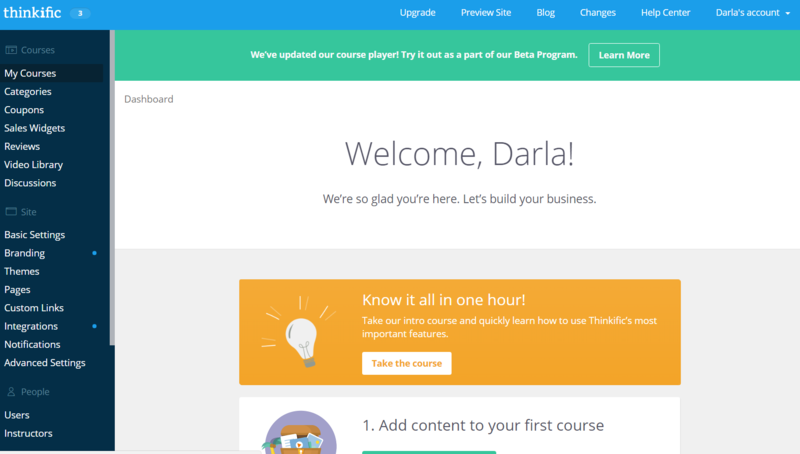 I didn’t want to spend an hour taking a course on Thinkific. So I decided to dive headlong in the expanse of course building space and get to it. 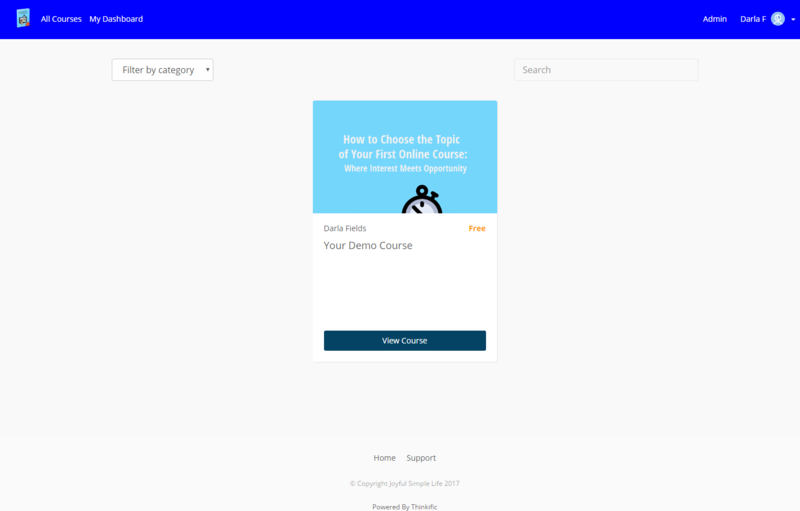 As you scroll down the template, Thinkific gives you suggestions and examples to create a beautiful (and converting) course landing page. Let’s head over to the Curriculum tab and get this course started. See it? More suggestions on how long each lesson should be. Nice way to guide newbies. My Module 1 had a few lessons in it. 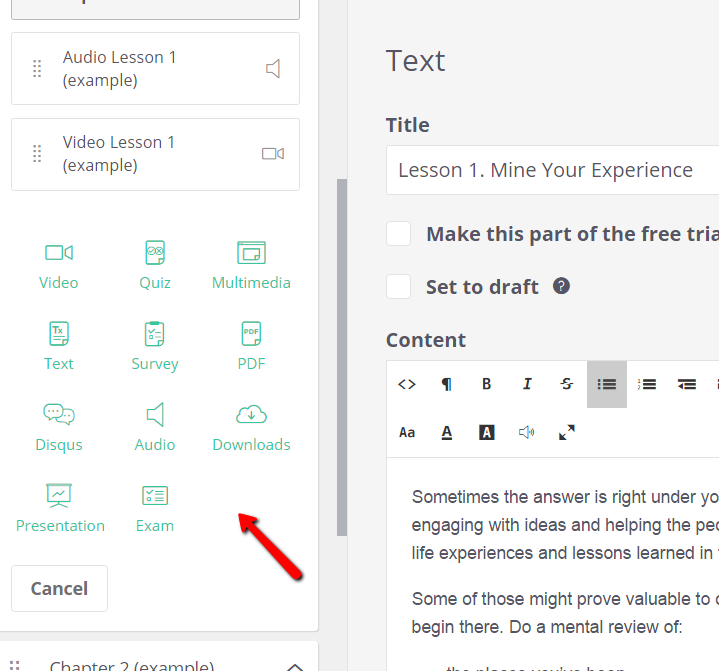 It was easy to add or delete lessons with a click of a button to open up your choices of copy/pasting text, uploading files, uploading media, etc. 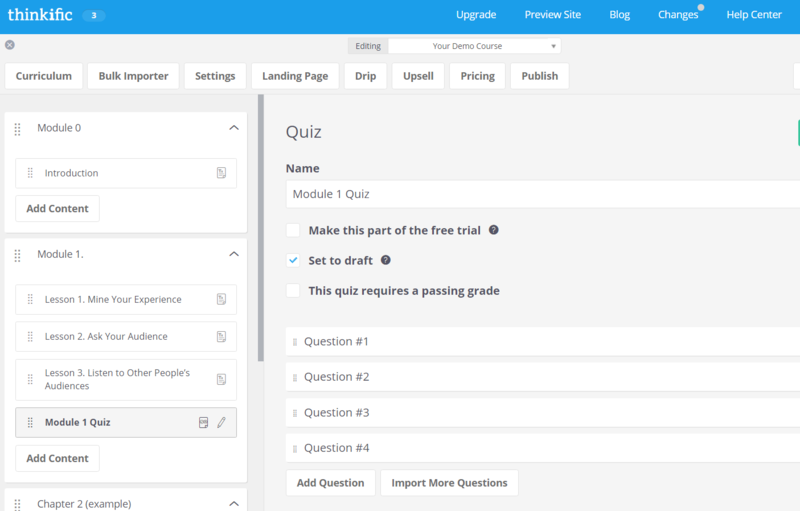 After adding all the lessons to Module 1, it was time to add the quiz. It wasn’t hard, and Thinkific lets you mark the correct answer. All questions entered and ready for my students. Besides the multiple choice quiz, there’s the survey type question that allows students to submit free text. Wanna take a peek at my magnum opus? Okay, I admit, it needs work. But, I can envision what it can be as I keep adding courses: tiles of courses flooding the page, students from around the world making a difference in their lives and their families’ lives. And it all started here. 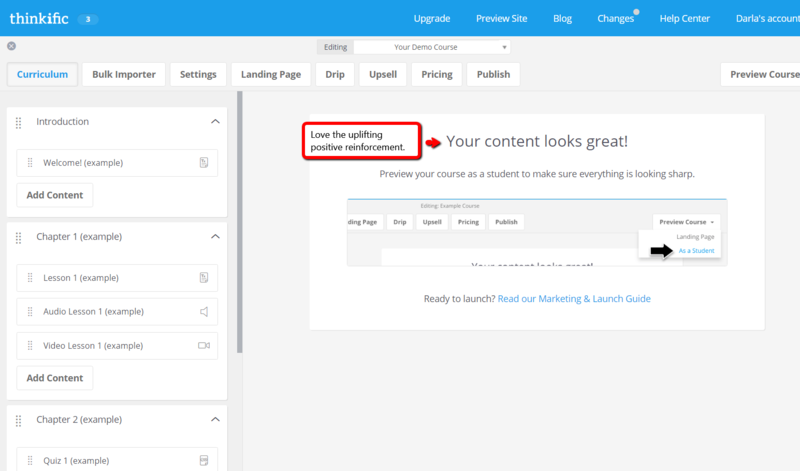 Notice, like the lessons, the landing page has placeholders and suggestions to make your page *pop* and engage your potential students. The student can click on the left-hand bar to switch between modules or click the “next” button in the bottom right corner. The pages are clean and easy to navigate-a huge bonus for your students. You might also have noticed the upper left-hand corner offers opportunities for students to check their progress and make comments-a great way to engage with your students. 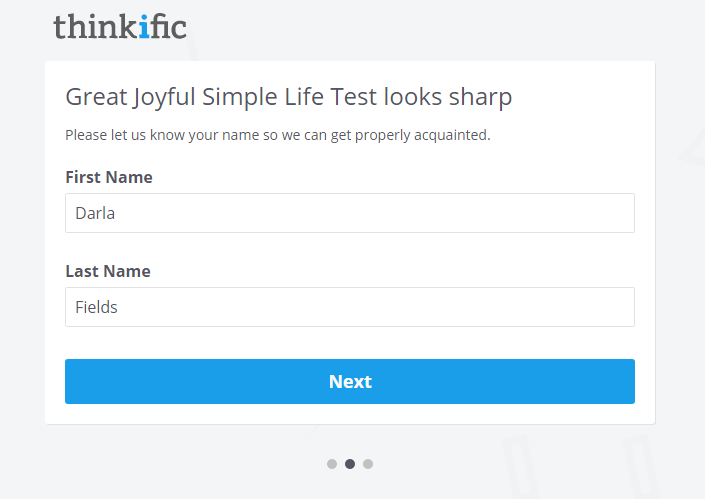 Ready for the main features to help you determine if Thinkific is right for you? Not in Starter ($0) version. Only in Essentials and higher. Yes. Drip is also available with paid versions. Yes. 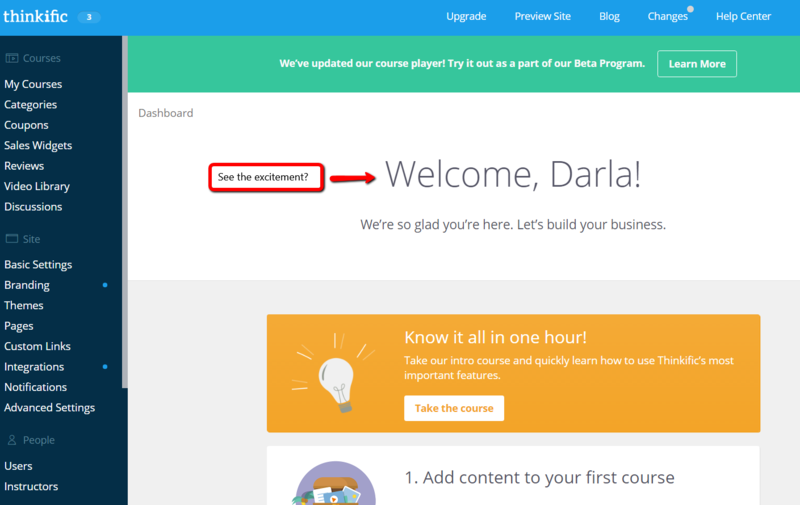 Automated Welcome/Course completion emails are in Starter. In Essentials, you also get access to Bulk Email Students. Student forum, which appears publicly. Students can share files within discussions for group assessment and feedback. No badges. Certificates can be issued with paid versions. Course progress of the whole student body, as well as segmentation based on filters like join date, progression, coupons used, etc. Minor, can see what they’re enrolled in, and their activity feed. 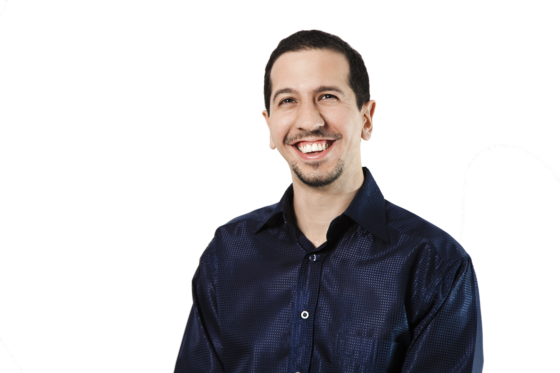 Affiliate management Yes, allows you to assign users as affiliates, provide them links, and allow for payouts. 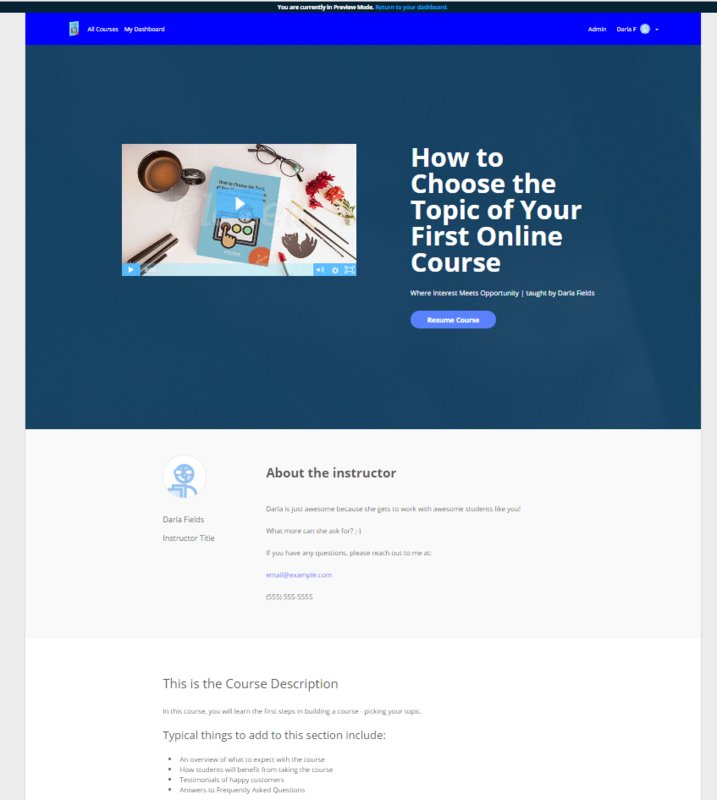 As I mentioned earlier, Thinkific promises you “everything you need to easily create, market, and sell your own online courses.” I believe it delivered on that promise. 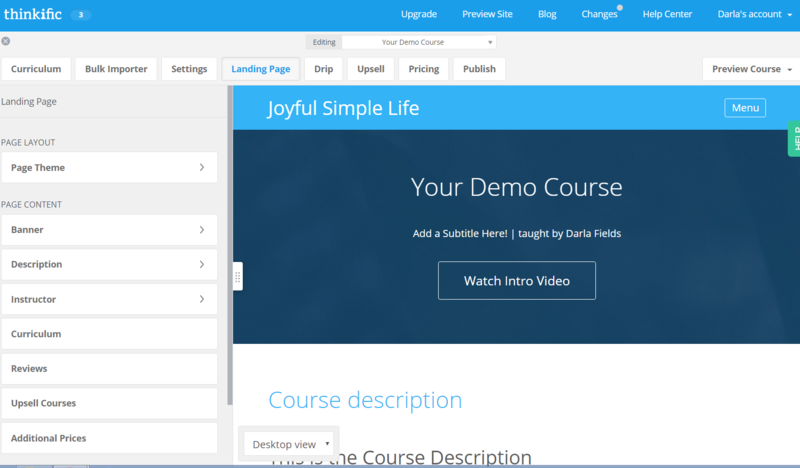 You can quickly create a course without having to spend a lot of time on design or technology. 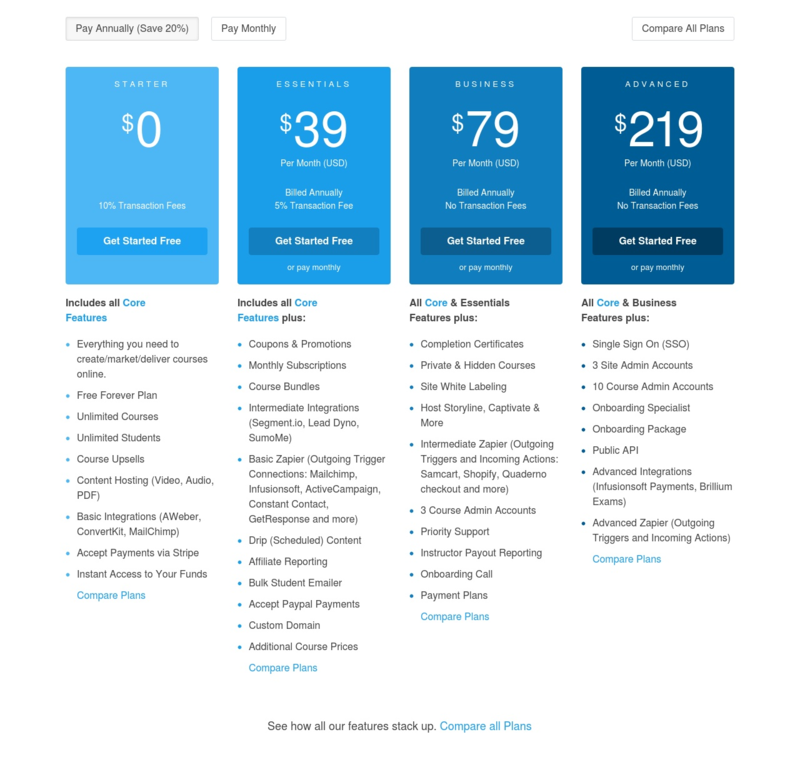 It has the ease of an all-in-one, plug-n’-play platform within the feel of the backend of a WordPress site. They also have a blog where experts weigh in on course creation. I loved the ease and speed of being able to jump right in (and ignore the tutorial video) to make your course. 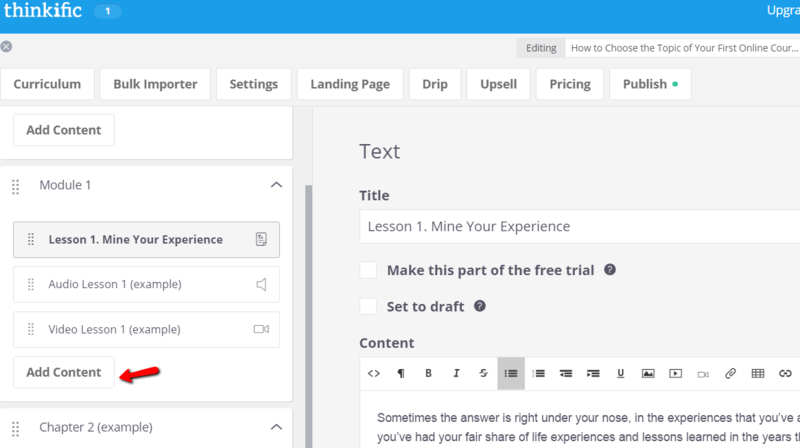 Also, the placeholder lessons teach you best practices so you can quickly get started—super helpful if you’re unsure. And everything loaded quickly. Finally, the prominent “Help” button on the right side of the page was comforting when I had questions. My short answer is: the potential for overwhelm. Even though I’m not a techy person, I’m not afraid of technology; yet, I found myself thinking, contemplating, and feeling my anxiety level rise at times. The platform is not as clean as other ones I’ve tried. A more detailed step-by-step checklist would benefit users. With that being said, if I had taken the time to watch the one-hour intro video, maybe I wouldn’t have felt as overwhelmed. A possible deal breaker is the lack of gamification within Thinkific. When I researched how to add badges, the last mention was from 2016. It’s on the horizon—just in the faint distance. 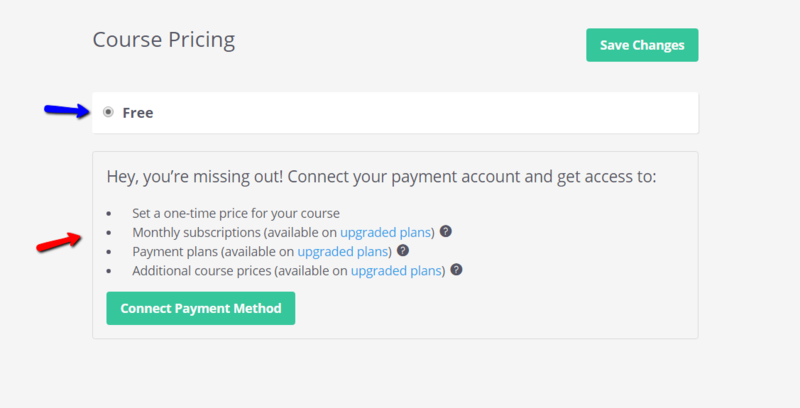 If you want to gamify your course, you may not want to choose Thinkific. Or be patient for future developments. If you’re comfortable with technology, have your course content ready, and don’t fret over a little bit of a learning curve, you can get up and running relatively quickly with Thinkific. I can recommend this to Mirasee’s Course Builder’s Laboratory (CBL) students. 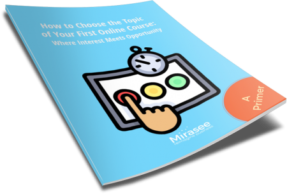 Having your content prepared can help ease some of the learning curve. 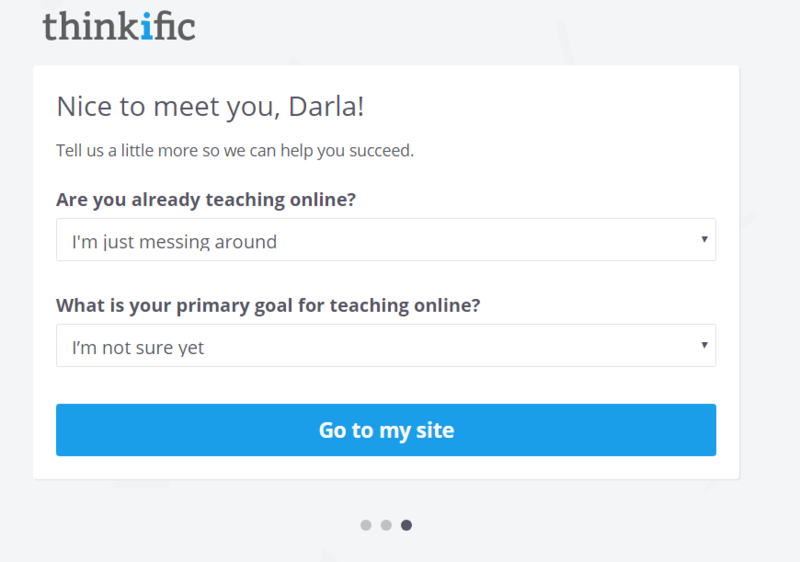 Also, since CBL students are taught to get feedback and provide methods for student interaction, Thinkific provides ways to do that, such as through open comments and surveys. If you are hesitant around technology, don’t be like Darla. Take the time to sit through the tutorial before beginning. You’ll get the 30,000-foot view of what you’ll be creating. 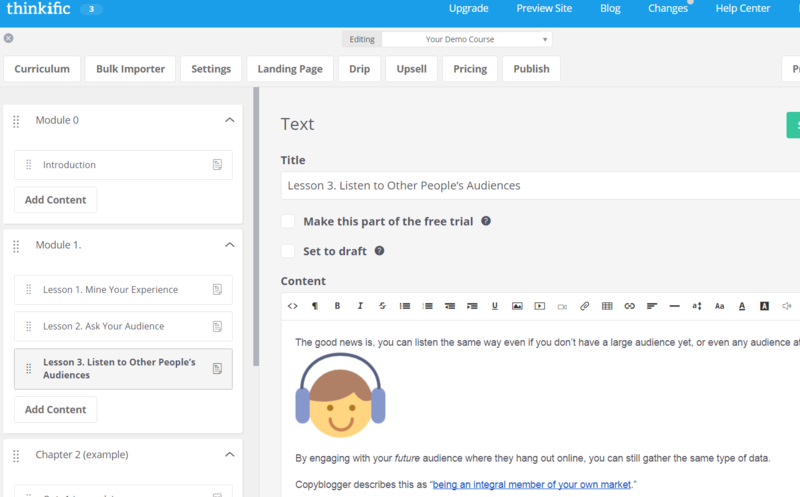 Take advantage of the placeholder prompts and enhance your course presentation. Thinkific offers a variety of options to add media, audio, text, PDFs, and suggestions of best practices. 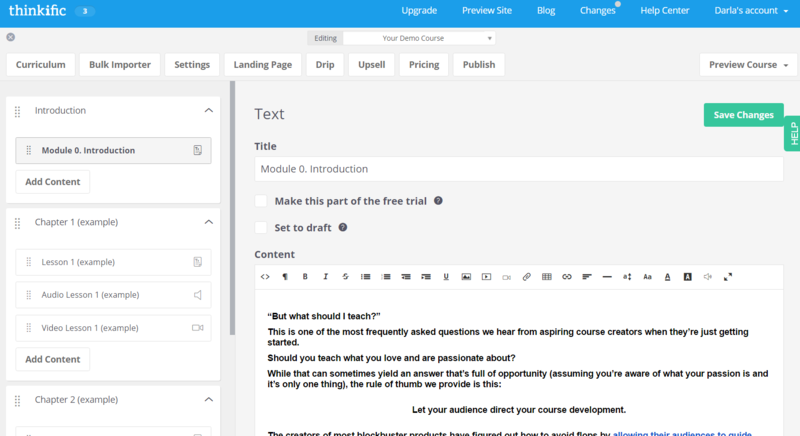 When you’re building your pilot course and only have an outline of what you’ll be teaching, the drag-and-drop feature will be a huge help in serving your students. Like some other platforms, the free plan may be handy for your pilot, but remember that it doesn’t allow for drip content. So, your students may try clicking into lessons they’re not quite ready for. 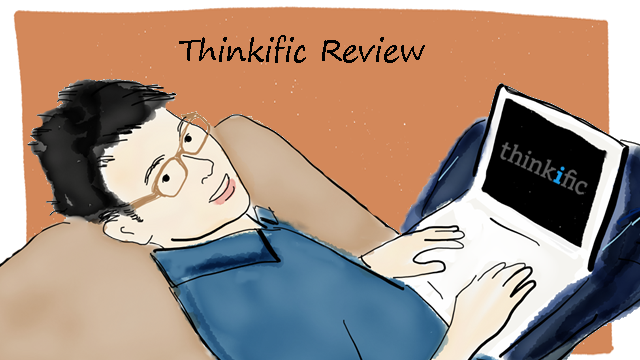 Consider what your course needs are and choose your Thinkific plan appropriately. Remember, if you want to use games and badges, it’s not going to happen with Thinkific. 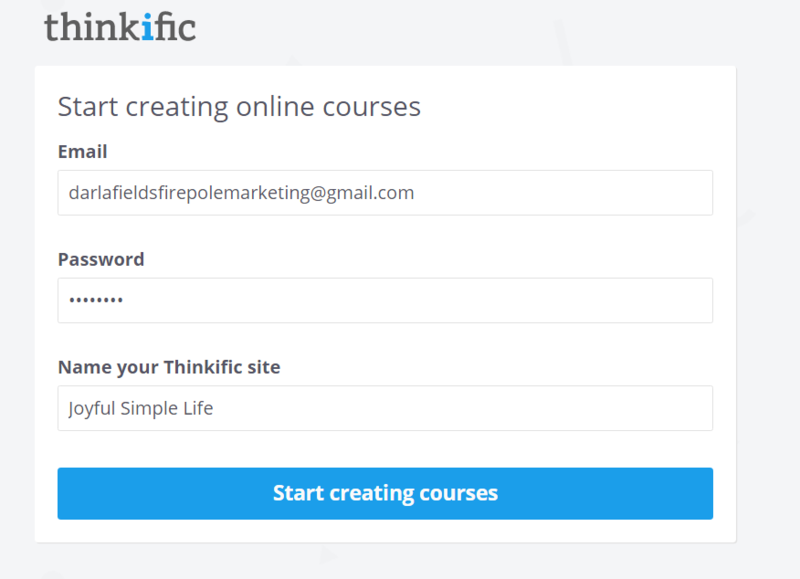 Thinkific is a great platform for creating, marketing, and selling your courses. 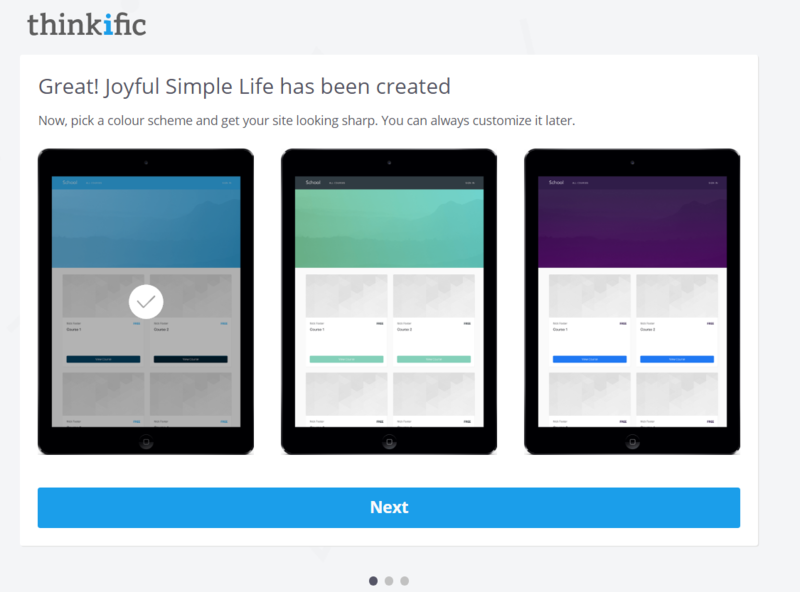 Think of it as a user-friendly platform with a backend WordPress feel. It’s easy to plug in your curriculum and rearrange items by dragging and dropping them. The suggestions in the placeholders are fantastic for making your site look as professional as possible to prospective students. However, if you want gamification, you probably ought to pass on Thinkific. Same thing if you shudder at the thought of a platform looking (and working) anything remotely like the backend of WordPress. It does have a more “technical” feel than other platforms. Bottom line: Thinkific is a great choice for you if you’re a little more tech-savvy and don’t mind a bit of a learning curve while you create your course. What are your thoughts on Thinkific? Does it provide all the features you’re looking for in an online course platform? 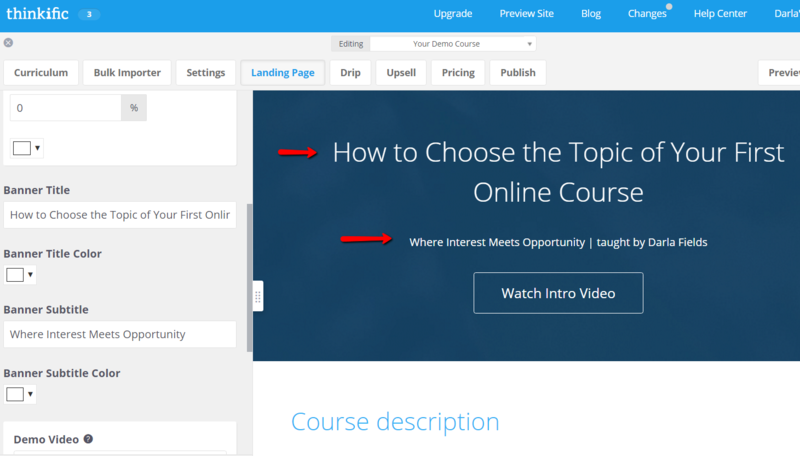 Next Post » LearnDash Review: Does It Deliver the Best in Online Course Creation? Thank you so much Darla, for doing this review! I’ve heard good things about Thinkific, but I didn’t know exactly what was under the hood. I appreciate the detailed investigation (and your sense of humor)! I appreciate this review as I am seriously looking into using this. The lack of gamification could be a deal breaker. What alternative would You suggest if I wanted to incorporate badges etc? Hi, Ron! Thanks for asking! Additionally, you can check out Kristine’s post on LearnDash. Wow, Darla! Fantastic review. It’s so detailed, it’s practically a tutorial–although it sounds like no tutorials are really necessary with Thinkific. Thanks for all your hard work!